Parable of Hide and Seek, by Chad Sweeney, Alice James Books, Farmington, Maine, 2010, 76 pages, $15.95 paperback, www.alicejamesbooks.org. Parable? Is Chad Sweeney playing with us? No, he's playing with language and his pleasure is evident. Is he serious? I think so. Consider parable itself, a simple story whose significance is confounded in its oblique reference to some larger narrative. Its intention is hidden. Meaning has yet to be assigned or remains to be discovered. Like a metaphor in its small realm, or like the cosmic function of myth, parable presents us with a reality that we comprehend by participating in its construct. By entering the experience of the story, one implicitly gains understanding. As Jesus, master of parable, said, "He who has ears, let him hear." 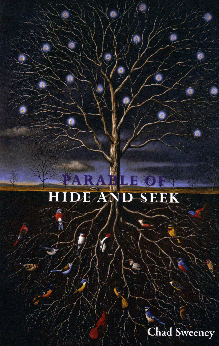 In his new collection, Parable of Hide and Seek, former San Francisco poet Chad Sweeney evokes the mystery of this process by asserting language itself as parable, or as he states in the penultimate poem, "Holy Holy," "a rummaging under / for what's not meant." I love how well we're set up for this even before the book is opened. The cover illustration, a cut-away, depicts a leafless tree in a stark night landscape whose bare branches are lit here and there with candles or perhaps burning leaves. In the cut-away view underground, the roots spread in mirror image to the crown. Among the roots, brilliantly colored small birds perch, a scene lit, it would seem, by the viewer herself. What is up is down, and the parable is "of" the process of being a parable, the hidden thing that must be brought to light. What is seen might be an inversion of what is intended. in the language of the world. I do not mean to suggest that Sweeney necessarily constructs his poems as parables, though once you're "in," many poems feel that way. Take for instance the prologue poem, our introduction to the collection. In the language of religion, in particular Judeo-Christian tradition, which I can't help but hear echo throughout the book, the poet offers the reader "The Promise," in effect, a compact with the poet. The speaker describes the situation. Someone turned the colors on early. There is light, there is air, there is color, and daybreak—perhaps a moment of creation? The world of perception surrounds the speaker to whom it appears lovely but unbalanced, fragile, "all things tipping," a sense that expands in the next several lines. But the speaker turns from his sensory perceptions to what energizes this scene, "the power lines." a glowing apple on a hill. The speaker says a remarkable thing. The power's "source" is a glowing apple on a hill. The source of power is an apple? Sound familiar? So the experience of the poem is one of parable, a story that seems to suggest a larger understanding that might be discovered by participating in the image making of the poem. This particular 'story', given its introductory position, its reference to biblical motif, and that it concludes with Edenic/kingdom of god imagery, clearly invites such consideration, such "rummaging around." While many of Sweeney's poems do have a narrative if not autobiographical impulse such as "Sparks," where "Dad," "my sister," and "our house" appear, others are confounding or perhaps too self-conscious of their disjunctive nature. In "A Stairway Down," for instance, miles of tracks lead through snow to a stairway and the speaker's impulse to call his probation officer. In general, however, it is Sweeney's control of the emotion of a piece, his deft use of image and sound and collage to evoke emotion that pulls the reader into the poem's embrace time and again. The poem, "Little Wet Monster," is a personal favorite. Dedicated to Sweeney's newborn son, Liam, the poem's language dances a love song, but often in images perverse, alarming, at times threatening. But, the poem's yearning is palpable. It is perhaps easier to observe in this non-narrative piece the "parable" that is sound and syntax, where words signifying one thing (woe, darkling, monster) can by their arrangement suggest something quite wonderful and different, a larger intent, or "what's not meant." You will find many fine poems in this new collection, poems of strange, lush image and sonic surety. Some readers won't have patience for the more associative pieces, a matter of stylistic preference. While Sweeney does play with language, my sense is that he is less concerned with testing language's diminished reputation to convey meaning than he is with plumbing language's limits to express life's bounty, all that he feels, whether in gain or loss. He's looking for the words that fit. The book, and poem "Holy Holy," ends with the line, "I rent / this language / to stay dry in." It's a parable. You tell me what is "not meant." In Parable of Hide and Seek,Chad Sweeney explores and celebrates with us what there may be to discover, or what might remain hidden. There is pleasure in seeking and finding what one desires, which is after all the enterprise of language. And there is great pleasure to be had in reading these poems. Sally Ashton is a poet, writer, and editor of the DMQ Review, an online journal featuring poetry and art. Her recent books of poetry are Some Odd Afternoon and Her Name is Juanita. She teaches at San Jose State University and lives in Los Gatos, California. 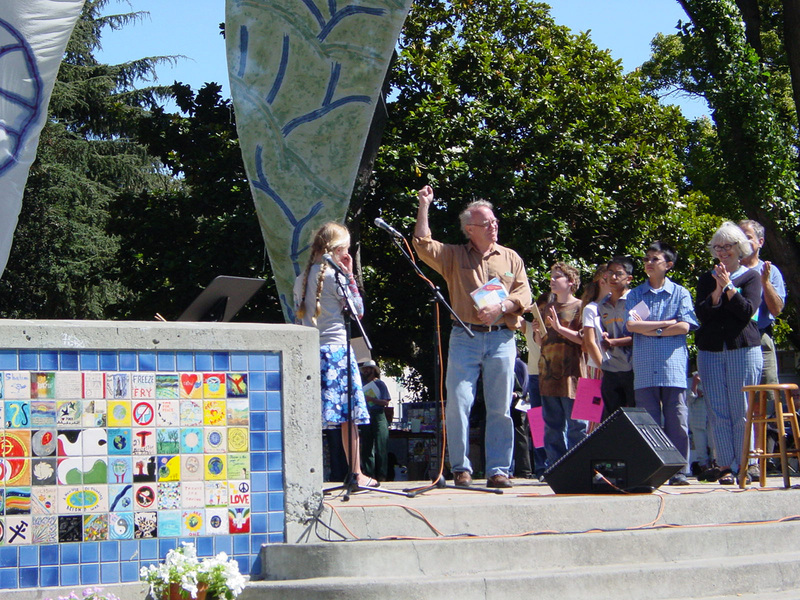 Sally Ashton has just been named 2011 Santa Clara County Poet Laureate, and is initiating a Favorite Poems Project for Santa Clara County, California residents. 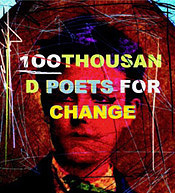 For full text and submission guidelines, see the "Favorite Poem Call," link on the Poet Laureate site, www.poetlaureateblog.org.